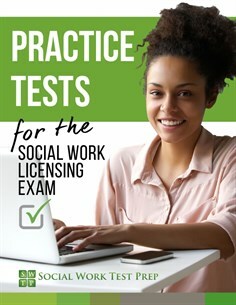 Right now, get SWTP's online practice exams at a reduced price, just $39 for the national ASWB and CA-BBS practice exams. Get additional savings when buying more than one exam at a time--less than $30 per exam. Save nine dollars when you buy two exams at once, only $69. Purchase three exams together for just $99. That's a savings of $18--only $33 per exam. Get four exams bundled together for $124. You save $32! Five exams purchased together are $144--save $51. Shorter booster tests, one all about the DSM, one all about ethics, are just $20 each--even less when purchased with ASWB exams. BEST DEAL: Get the Complete Exam Bundle--all five ASWB practice tests plus the DSM & Ethics Boosters--over 900 questions, for just $159. That's less than $30 per exam! You save $76! To get started, create an account. Subscriptions last 90 days; extensions are free. You get unlimited Study Mode and Review Mode access, plus three runs through each test in timed Exam Mode. Find more information here or sign up to get started! Exams 1-5 contain 170 unique questions each, based upon the ASWB clinical exam outline. They'll help prepare you for the entire ASWB slate: the Clinical Exam (LCSW, LICSW), the Master's Exam (LMSW), the Advanced Generalist Exam (LGSW), and the Bachelor's Exam (in most states, LSW). Get practice, get licensed! For ASWB exam preppers who want some extra questions about social work ethics (a big part of the exam), this is a 45-question all-ethics practice test. Just $20. Note: The Ethics Booster is suggested for those who have not taken our CA L&E practice test, since there's significant overlap between those two. Focus exclusively on assessment and diagnosis with this 56-question test. Each question includes thorough rationales and suggested study links. Just $20! This year, California switched to the ASWB exam plus a 75-question, 90-minute California Law & Ethics exam. Our practice test is $24. Note: The L&E Exam and Ethics Booster contain many of the same questions--choose one, but not both. Share about SWTP with your networks and get access to a free bonus exam!